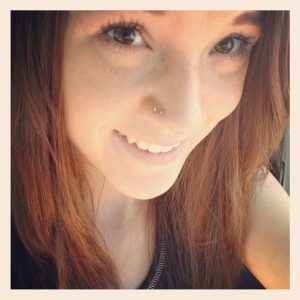 What is Double Nose Piercing? Double Nose Piercing forms most updated look especially in the fashion industry equally liked by both male and female irrespective of their sexes. It is a bolder, daring and a good option for those who want to seek attention, as it brings symmetry to nose piercings if it is on either side. Double Nose piercing on opposite sides (Double Nostril Piercing): Symmetric piercing on either side of the nostrils. 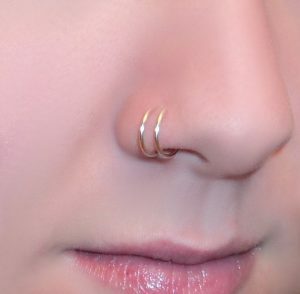 Double Nose piercing on the same side (Double Nostril Piercing): Both the piercings are on one side of the nostril. Septum piercing: Piercing is on the middle part of the nostrils on the wall separating them. 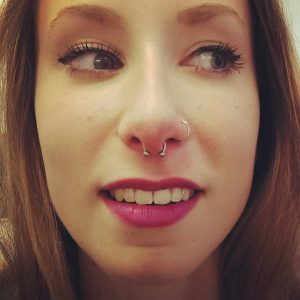 Double septum piercing: Double septum is similar to the septum piercing where the only difference is that the septum is punched twice. Professional will clean the nose with an antiseptic liquid. He/she will mark two spots where the future holes are to be made. A special cork will be placed to make space for the piercing and avoiding any wrong perforation. Piercer will puncture a hole or two using a hollow needle. Removal of cork and insertion of jewelry will take place. The piercing should take place only at an authentic parlor having a license for piercing. The equipment should be sterilized before use. Nose is a sensitive part of the body, and it can probably hurt while piercing. Twinge depends on individual sensitivity as well as to the extent of the piercing. The nerve endings on the nose directly connect with the eyes, and it can make the eyes watery. A needle used for this kind is quite thin as compared to cartilage piercings so some people can experience just a pinch on this part of the nose. A nostril piercing can take between 4 to 6 months to recover fully. It majorly depends on the aftercare that is a must after piercing. A septum piercing, however, takes about 6 to 8 weeks if correctly performed. 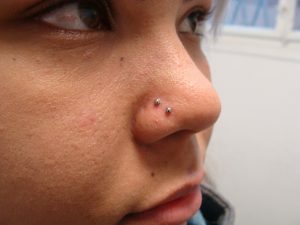 The vertical nose piercing or rhino piercing takes more time for healing which is estimated to be around 6 to 9 months. Clean the perforation using a warm saline solution using a cotton swab. H2O ocean spray is also useful to prevent infections. While cleaning the piercing area, be gentle. Use clean handkerchiefs to wipe the area. Take a few tea bags of Matricaria, distil them and then keep the hot pack on the nostril. Take Vitamin B12, C and Zinc to quicken up the healing process. Do not touch the piercing with unclean hands. Do not fiddle or play with the jewelry. Avoid using cosmetics near the piercing area. Do not go swimming in public pools. Nose projects from the face and is more likely to come in contact with clothes while wearing them. Stretching of the skin is a common risk factor. When a person is suffering from a common cold, the irritation can stimulate the sensation for itching causing injuries. The most significant risk in any piercing is that of contagion. Here are some signs that indicate that germs have hit the piercing. As there are two perforations on the nose, there are twofold chances for them to get an infection. Nose is the part through which respiration takes place. There are microbes present in dust and air in the surroundings. While inhaling, the air microbes come in contact with the nostrils. Therefore, it is prone to infection more than any other piercing. Do not panic in this situation. All you need is to consult your physician if these symptoms occur. Follow his prescription and instructions. During the healing process, the best jewelry is the small labrets flat at either side. The reason to choose them over others is that they do not entangle in the nostril. Captive Bead Rings are good options for initial days. After healing, the jewelry can be of your choice. Studs: Are incredibly versatile both small, big and available in shapes of hearts or cross signs. They can be more noticeable or less visible. They are perfect for piercings on both sides. Hoops & rings: Vary in sizes and designs that look appealing. Double hoops look apt with side piercing. In case you are looking for expensive pieces, gold jewelry embedded with diamonds can be vibrant choice. How much does it cost to get a nose piercing? The prices vary for different salons and depend on the jewelry you opt. A single nose piercing costs $48-$55, while double piercing can cost $70-$100.